Porter's article explains the processes far more eloquently than I can. I've always been OK with Fire Engine Red, Canary Yellow, Sky Blue, and so on, but all of the intermediate and pastel colours have always been a problem, tending to blend into an undistinguished green-red-brown-pink-purple. Many colours that are dramatically different to most people are virtually indistinguishable for me. The best description that I have been able to explain the EnChroma experience is like sitting in front of a well-adjusted colour TV, and then turning the “Colour / Saturation” settings up by about 25% – all the colours are “real”, but they become much more rich, vivid and saturated. Pastel shades which have very little colour intensity to my unaided eye now show much more saturation, with what were previously subtle differences between two shades now becoming much more distinguishable. But beyond the main EnChroma / Colour Blindness theme, there's some fascinating stuff about the impact of language and culture on our perception of colour. Did you know that the ancient Greeks didn't think the sky was blue? Or that there is a tribe in modern-day Namibia who can easily see the one square in the first pattern below which has a different shade of green (I sure can't), but struggle to see the blue square in the second pattern? Amazing stuff! I don't want to disparage other glasses which are advertised as enhancing colour blindness, as they may work well for many people, but I tried another brand a few years ago, and they didn't have a huge effect for me. (The EnChroma lenses are chalk and cheese in comparison for me). With respect to the technology aspect (narrow-band "notch" filters vs. "broadband" dye filters) - I don't know whether the benefits of narrow-band filters will apply equally to everyone, and I don't know whether any of the other brands are now using narrow-band filters - their website aren't always clear on the exact filter technology being used. 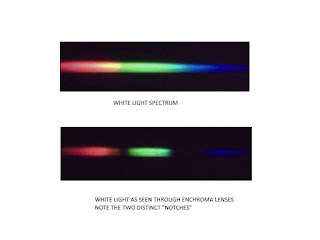 Narrow-band filters (as used in EnChroma) cut out a very specific "notch" of wavelengths (colours) while allowing very similar adjacent wavelengths to pass almost unaffected. Broadband dye filters (which is what the brand I tried previously USED to use, but I am not sure about now) generally suppress a range of colours, but then a have smooth "shoulder" of rising transparency for the adjacent colours that you want to pass - think of it as a sheer-edged canyon versus a smooth river valley. 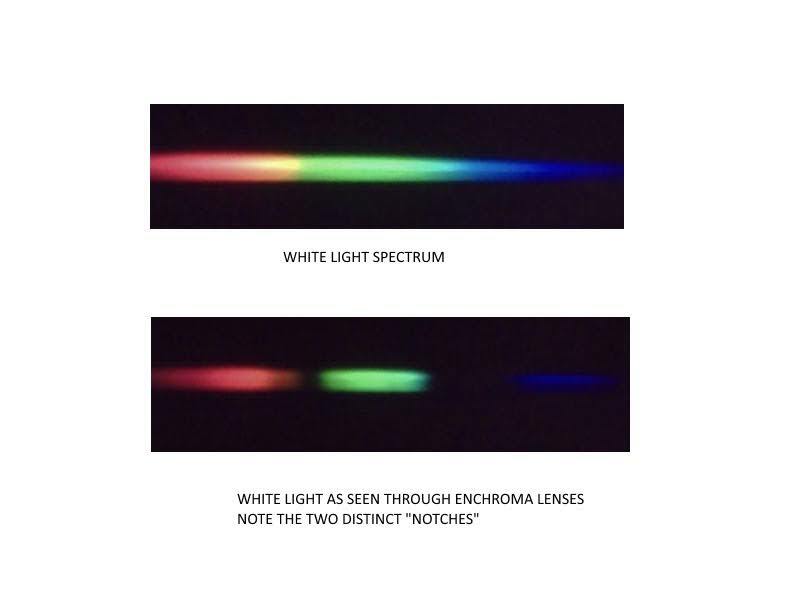 I expect to see the same effect on natural rainbows (but I haven't seen any since I got the glasses) - they will presumably split into three coloured bands with a narrow gap between them. I think this is why the EnChroma lenses work so well for me - the Red-Green "notch" drives a "wedge" between my Red and Green receptors, allowing my eye to see colours in the Red-Green range as either predominantly Red or predominantly Green, but it does have the side-effect of making a few colours that span right across the "notch" a richer, darker colour (drab olive greens and khaki colours tend to become richer in hue but darker). The broadband dye filters that I tried a couple of years ago don't have such a strong differentiating effect for me, but others may get a different effect (and they may have changed their lens technology in the last couple of years). I think that the Blue notch in the narrowband EnChroma filter is not particularly "useful" for enhancing my colour perception (as I am Red-Green colour blind), but it is also why some digital displays get a green cast - if the peak wavelength of the Blue pixel in the RGB display falls right in the "notch", then the Blue signal is heavily suppressed, and White on an RGB display with very little Blue signal tends to come out greenish. So far, it seems that some (but not all) outdoor digital signs have this effect, and OLED computer / phone / tablet displays in particular seem to have the effect, but LED computer screens and TVs seem to be fine. My guess is that the Blue pixel in those outdoor signs and OLED displays happens to fall right in the "notch", but other display types have a different spread of Blue in their RGB mix, so plenty of Blue still gets past on each side of the "notch". 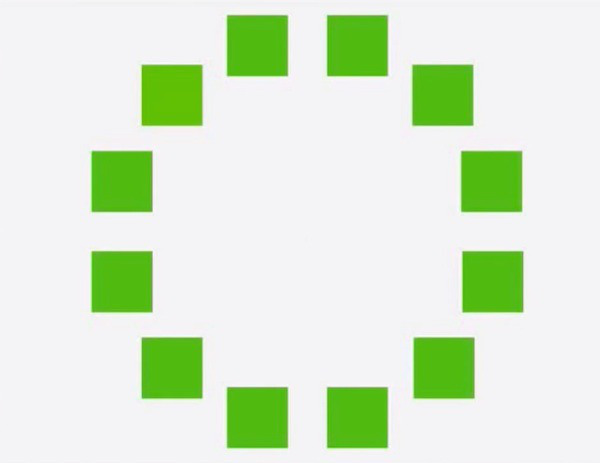 I suspect that the exact narrow-band filter "notches" that EnChroma use on their Cx-65 Indoor / Computer lenses may be tuned differently, to avoid excessive tinting on digital displays (but I haven't tried a pair to be certain).